It’s the island of Corfu, where Grecotel occupies the most gorgeous Kommeno peninsula, one of the most exclusive spots in the Ionian harbours. 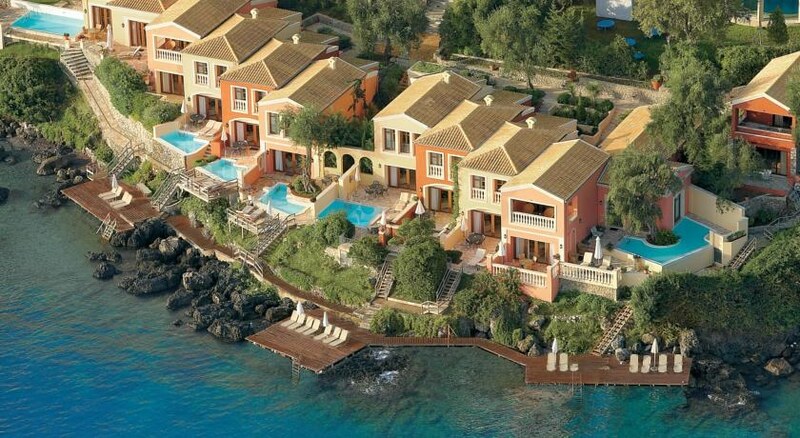 Corfu Imperial nestles peacefully in the lush scenery and pristine waters of its own private peninsula. Arriving with your private yacht direct on our exclusive Kommeno, check-in will take place direct 'on board', club car service will waiting for your private villa-palazzo transfer and the Corfu Imperial experience just started! Combined with a flair for showcasing contemporary Mediterranean food and sweeping views over the Ionian Sea, the “Mon Repos” Mediterranean restaurant at the Corfu Imperial promises to stimulate your senses. Choose from a variety of hot and cold dishes and delicious desserts. The elegant, spacious guestrooms are decorated in glamorous Italian style with rich fabrics, parquet floors and antique furniture. Satin headboards and bedcovers on the king size beds add luxurious touches. 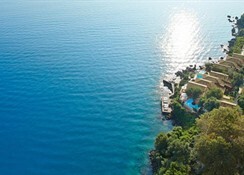 Magnificent views of established gardens and the Ionian Sea from the floor-to-ceiling picture windows and the balcony. Some with connecting door. The brand new spacious guestrooms have been lifted to fresh heights with exclusive decoration. They feature elegant furnishings, designer fabrics and a fusion of old fashioned hospitality décor highlighted with modern amenities where you instantly feel at home. The ivory and beige hues perfectly matched with parquet floors create a luxurious atmosphere in these unique light-filled guestrooms. magnificent views of established gardens and the Ionian Sea from the floor-to-ceiling picture windows and airy furnished balcony for summer living. Some with connecting door. 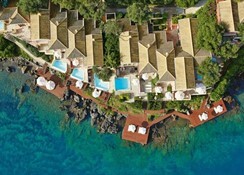 Superior bungalows are set in the verdant gardens with access to one of the hotel’s private beaches. They offer spacious accommodation for couples. 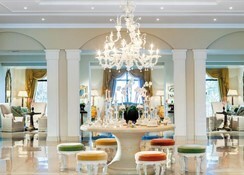 The classical Italianate furniture reflects the Corfiot history. The pretty mosaic-tiled bathroom has bath, WC and separate shower cubicle in some bungalows. 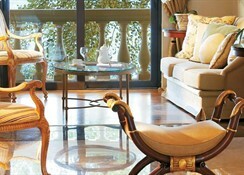 Panoramic floor-to-ceiling glass doors lead out to a balcony or terrace and lawn equipped with sun loungers. • 281 luxurious sea view guestrooms including suites, dream villas & palazzos with private pools and New Penthouse family suites. • Grecoland children’s club with Discovery Adventures. Tasty Corner free kids dining for excellent family vacations.